Nevertheless, I uttered those four words in last week’s letter. I stand by them, too. In the next 20 years, we’re going to see changes that humanity has never seen before, and in some cases never even imagined, and we’re going to have to change. I truly believe this. We have unleashed economic and technological forces we can observe but not entirely control. I will defend this bold claim at greater length in my forthcoming book, The Age of Transformation. Today we will zero in on one of those forces, which last week I called “the bubble in government promises,” which I think is arguably the biggest bubble in human history. Elected officials at all levels have promised workers they will receive pension benefits without taking the hard steps necessary to deliver on those promises. This situation will end badly and hurt many people. Unfortunately, massive snafus like this rarely hurt the politicians who made those overly optimistic promises, often years ago. Earlier this year I called the pension mess “The Crisis We Can’t Muddle Through.” Reflecting since then, I think I was too optimistic. Simply waiting for the floodwaters to drop down to muddle-through depth won’t be enough. We face an entire new ocean, deeper and wider than we can ever cross unaided. This year marks the first time on record that two Category 4 hurricanes have struck the US mainland in the same year. Worse, Harvey and Irma landed directly on some of our most valuable and vulnerable coastal areas. So now, in addition to all the problems that existed a month ago, the US economy has to absorb cleanup and rebuilding costs for large parts of Texas and Florida, as well as our Puerto Rico and US Virgin Islands territories. The storm was unprecedented, but the city has been deceiving itself for decades about its vulnerability to flooding, said Robert Bea, a member of the National Academy of Engineering and UC Berkeley emeritus civil engineering professor who has studied hurricane risks along the Gulf Coast. The city’s flood system is supposed to protect the public from a 100-year storm, but Bea calls that “a 100-year lie” because it is based on a rainfall total of 13 inches in 24 hours. Anybody who lives in Houston can tell you that 13 inches in 24 hours is not all that unusual. But how do Robert Bea’s points apply to today’s topic, public pensions? Both pension plan shortfalls and hurricanes are known risks for which state and local governments must prepare. And in both instances, too much optimism and too little preparation ultimately have devastating results. Admittedly, public pension liabilities don’t come out of nowhere the way hurricanes seem to – we know exactly where they will strike. In many cases, we know approximately when they’ll strike, too. Yet we still let our elected officials make impossible-to-fulfill promises on our behalf. The rest of us are not so different from those who built beach homes and didn’t buy hurricane or storm surge insurance. We just face a different kind of storm. Worse, we let our government officials use predictions about future returns that are every bit as unrealistic as calling a 13-inch rain in Houston a 100-year event. And while some of us have called pension officials out, they just keep telling lies – and probably will until we reach the breaking point. Puerto Rico is a good example. The Commonwealth was already in deep debt before Irma blew in – $123 billion worth of it. There’s simply no way the island can repay such a massive debt. Creditors can fight in the courts, but in the end you can’t squeeze money out of plantains or pineapples. Not enough money, anyway. Now add Irma damages, and the creditors have even less hope of recovering their principal, let alone interest. Puerto Rico is presently in a new form of bankruptcy that Congress authorized last year. Court proceedings will probably drag on for years, but the final outcome isn’t in doubt. Creditors will get some scraps – at best perhaps $0.30 on the dollar, my sources say – and then move on. We’re going to find out how strong those credit insurance guarantees really are. “That’s just Puerto Rico,” you may say if you’re a US citizen in one of the 50 states. Be very careful. Your state is probably not so much better off. In 10 years, your state may well be in the same place where Puerto Rico is now. I’d say the odds are better than even. Are your elected leaders doing anything about this huge issue, or even talking about it? Probably not. As it stands now, states can’t declare bankruptcy in federal courts. Letting them do so would raises thorny constitutional issues. So maybe we’ll have to call it something else, but it’s going to end the same way. Your state’s public-sector retirees will not get what they were promised, and they won’t take the outcome kindly. Public sector bankruptcy, up to and including state-level bankruptcy, is fundamentally different from corporate bankruptcy in ways that many people haven’t considered. The pension crisis will likely expose those differences as deadly to creditors and retirees. Say a corporation goes bankrupt. A court will take all its assets and decide how to divvy them up. The assets are easy to identify: buildings, land, intellectual property, cash, etc. The parties may argue over their value, but everyone knows what the assets are. They won’t walk away. Not so in a public bankruptcy. The primary asset of a city, county, or state is future tax revenue from households and businesses within its boundaries. The taxpayers can walk away. Even without moving, they can bypass sales taxes by shopping elsewhere. If property taxes are too high, they can sell and move. When they take a loss on the sale, the new owner will have established a property value that yields the city far less revenue than it used to receive. Cities and states don’t have the ability to shed their pension liabilities. They are stuck with them, even as population and property values change. About 200 entities in Harris County can charge taxes. That includes governments from Houston to Baytown to Hedwig Village, plus 20 independent school districts. There’s a hospital district, port authority, several college districts, the flood control district, a multitude of utility districts, and the Harris County Department of Education. Some homes may fall within 10 or more jurisdictions. What about those thousands of flooded homes in and around Houston; how much are they worth? Right now, I’d say their value is zero in many cases. Maybe they will have some value if it’s possible to rebuild, but at the very least they ought to receive a sharp discount from the tax collector this year. Considering how many destroyed or unlivable properties there are all over South Texas, I suspect cities and counties will lose billions in revenue even as their expenses rise. That’s a small version of what I expect as city and state pension systems all over the US finally face reality. Here in Dallas I pay about 2.7% in property taxes. When I bought my home over four years ago, I checked our local pension and was told we were 100% funded. I even mentioned in my letter that I was rather surprised. Turns out they lied. Now, realistic assessments suggest they will have to double the municipal tax rate (yes, I said double) to be able to fund fire and police pension funds. Not a terribly popular thing to do. At some point, look for taxpayers to desert the most-indebted cities and states. Then what? I don’t know. Every solution I can imagine is ugly. Total unfunded liabilities in state and local pensions have roughly quintupled in the last decade. You read that right – not doubled, tripled or quadrupled: quintupled. That’s nice when it happens on a slot machine, not so nice when it’s money you owe. You will also notice in the chart that much of that change happened in 2008. Why was that? That’s when the Fed took interest rates down to nearly zero, meaning it suddenly took more cash to fund future payments. Also, some strapped localities conserved cash by promising public workers more generous pension benefits in lieu of pay raises. Kentucky, for instance, has unfunded pension liabilities of $40 billion or more. This month the state budget director notified local governments that pension costs could jump 50-60% next year. That’s due to a proposed reduction in the system’s assumed rate of return from 7.5% to 6.25% – a step in the right direction but not nearly enough. Think about this as an investor. Do you know a way to guarantee yourself even 6.25% average annual returns for the next 10–20 years? Of you don’t. Yes, some strategies have a good shot at doing it, but there’s no guarantee. Now, here is the truth about pension liabilities. Let’s assume you have $1 billion in funding today. 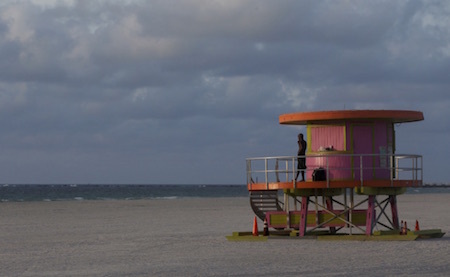 If you assume a 7% compound return – about the average for most pension funds – then that means in 30 years that $1 million will have grown to $8 billion (approximately). Now, what if it’s a 4% return? Using the Rule of 72, the $1 billion grows to around $3.5 billion, or less than half the future assets in 30 years if you assume 7%. Remember that every dollar that is not funded today means that somewhere between four dollars and eight dollars will not be there in 30 years when somebody who is on a pension is expecting to get it. Worse, without proper funding, as the fund starts going negative, the funding ratio actually gets worse, sending it into a death spiral. The only way to bring it out of the spiral is with huge cuts to other needed services or with massive tax cuts to pension benefits. 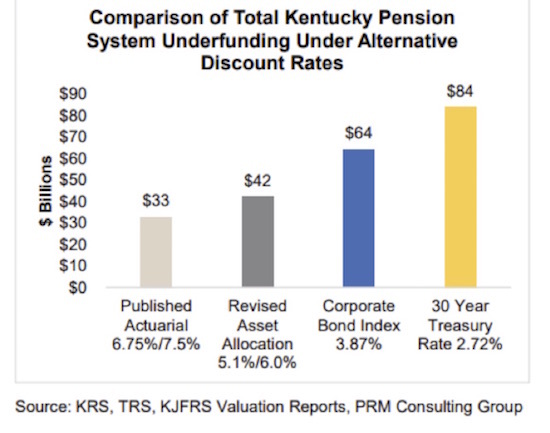 The news for Kentucky retirees is quite dire, especially considering what returns on investments are realistically likely to be. But there’s a make or break point somewhere. What if pension plans must either hit that 6% average annual return for 2018–2028 or declare bankruptcy and lose it all? That’s a much greater problem, and it’s a rough equivalent of what state pension trustees have to do. Failing to generate the target returns doesn’t reduce the liability. It just means taxpayers must make up the difference. But wait, it gets worse. The graph we showed earlier stated that unfunded pension liabilities for state and local governments was $2 trillion. But that assumes an average 7% compound return. 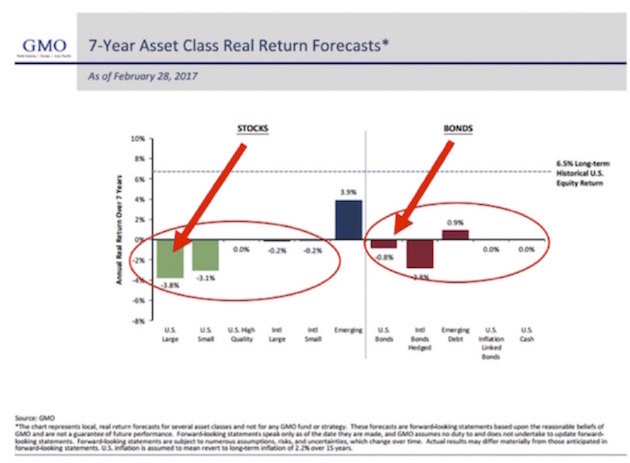 What if we assume 4% compound returns? 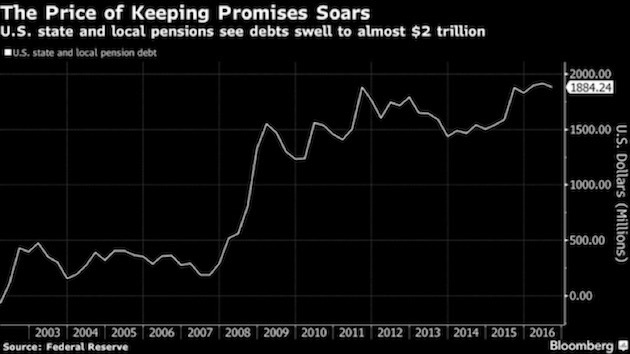 Now the admitted unfunded pension liability is $4 trillion. But what if we have a recession and the stock market goes down by the past average of more than 40%? Now you have an unfunded liability in the range of $7–8 trillion. We throw the words a trillion dollars around, not realizing how much that actually is. Combined state and local revenues for the US total around $2.6 trillion. Following the next recession (whenever that is), the unfunded pension liabilities for state and local governments will be roughly three times the revenue they are collecting today, and that’s before a recession reduces their revenues. Can you see the taxpayer stuck between a rock and a hard place? Two immovable objects meeting? The math just doesn’t work. Pension trustees don’t face personal liability. They’re literally playing with someone else’s money. Some try very hard to be realistic and cautious. Others don’t. But even the most diligent can’t control when the next recession comes, or when the stock market will crash, leaving a gaping hole in their assets while liabilities keep right on rising. Intentionally or not, state and local officials all over the US made pension promises that future officials can’t possibly keep. Many will be out of office when the bill comes due, protected from liability by sovereign immunity. We are starting to see cities filing for bankruptcy. That small ripple will be a tsunami within 7–10 years. But wait, it gets still worse. (Do you see a trend here?) Many state and local governments have actually 100% funded their pension plans. Some states and local governments have even overfunded them – assuming they get their projected returns. What that really means is that the unfunded liabilities are more concentrated, and they show up in unlikely places. You think Texas is doing well? Look at some of our cities and weep. Look, too, at other seemingly semi-prosperous cities all over the country. Do you think the suburbs of Dallas will want to see their taxes increased to help out the city? If you do, I may have a bridge to sell you – unless you would rather have oceanfront properties in Arizona. This issue is going to set neighbor against neighbor and retirees against taxpayers. It will become one of the most heated battles of my lifetime. It will make the Trump-Clinton campaigns look like a school kids’ tiddlywinks smackdown. I was heavily involved in politics at both the national and local levels in the 80s and 90s and much of the 2000s. Trust me, local politics is far nastier and more vicious. And there is nothing more local than police and firefighters and teachers seeing their pensions cut because the money isn’t there. Tax increases of up to 100% are going to become commonplace. But even these new revenues won’t be enough… because we will be acting with too little, too late. This is the core problem. Our political system gives some people incentives to make unrealistic promises while also absolving them of liability for doing so. It also places the costs of those must-break promises on innocent parties, i.e. the retirees who did their jobs and rightly expect the compensation they were told they would receive. So at its heart the pension crisis is really not a financial problem. It’s a moral and ethical problem of making and breaking promises that profoundly impact people’s lives. Our culture puts a high value on integrity: doing what you said you would do. We take a job because the compensation package includes x, y and z. Then someone says no, we can’t give you z, so quit and go elsewhere. 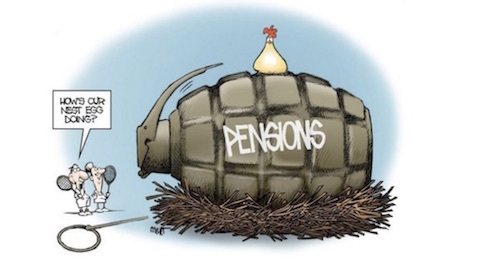 The pension problem is going to get worse as more and more retirees get stuck with broken promises, and as taxpayers get handed higher and higher bills. These are irreconcilable demands in many cases. It’s not possible to keep contradictory promises. What’s the endgame? I think much of the US will end up like Puerto Rico. But the hardship map will be more random than you can possibly imagine. Some sort of authority – whether bankruptcy courts or something else – will have to seize pension assets and figure out who gets hurt and how much. Some courts in some states will require taxes to go up. But courts don’t have taxing authority, so they can only require cities to pay, but with what money and from whom? In many states we literally don’t have the laws and courts in place with authority to deal with this. And just try passing a law that allows for states or cities to file bankruptcy in order to get out of their pension obligations. The struggle will get ugly, and innocent people on both sides will be hurt. We hear stories about retired police chiefs and teachers with lifetime six-digit pensions and so on. Those aberrations (if you look at the national salary picture) are a problem, but the more distressing cases are the firefighters, teachers, police officers, or humble civil servants who served the public for decades, never making much money but looking forward to a somewhat comfortable retirement. How do you tell these people that they can’t have a livable pension? We will see many human tragedies. On the other side will be homeowners and small business owners, already struggling in a changing economy and then being told their taxes will double. This may actually happen in Dallas; and if it does, we won’t be alone for long. The website Pension Tsunami posts scores of articles, written all across America, about pension problems. We find out today that in places like New York and Chicago and Cook County, pension funds have more retirees collecting than workers paying into the fund. There are more retired cops in New York and Chicago than there are working cops. And the numbers of retirees just keep growing. On an individual basis, it is smart for the Chicago police officer to retire as early possible, locking in benefits, go on to another job that offers more retirement benefits, and round out a career by working at least three years at a private job that qualifies the officer for Social Security. Many police and fire pensions are based on the last three years of income; so in the last three years before they retire, these diligent public servants work enormous amounts of overtime, increasing their annual pay and thus their final pension payouts. As I’ve said, this is the crisis we can’t muddle through. While the federal government (and I realize this is economic heresy) can print money if it has to, state and local governments can’t print. They actually have to tax to pay their bills. It’s the law. It’s also an arrangement with real potential to cause political and social upheaval that Americans have not seen in decades. The storm is only beginning. Think Hurricane Harvey on steroids, but all over America. Of all the intractable economic problems I see in the future (and I have a vivid imagination), this is the most daunting. I will be in Chicago the afternoon of August 26, meeting with clients and friends, and then I’ll speak at the Wisconsin Real Estate Alumni conference the morning of the 28th, before returning to Dallas that afternoon and flying with Shane to Lisbon the next day. My hosts are graciously giving me a few extra days to explore Lisbon, and Portugal is one of the last two Western European countries I have never been to. After this, only Luxembourg is left, so the next time I’m in Brussels or Amsterdam on a Sunday, I’m going to get on a train and go have lunch in Luxembourg. I return to Dallas to speak at the Dallas Money Show on October 5–6. You can click on the link for details. I will speak at an alternative investments conference in Denver on October 23–24 (details in future letters) and return to Denver on November 6 and 7, speaking for the CFA Society and holding meetings. After a lot of small back-and-forth flights in November, I’ll end up in Lugano, Switzerland, right before Thanksgiving. Busy month! Then there will be a (currently) lightly scheduled December, followed by an early trip to Hong Kong in January. It looks like Lacy Hunt and his wife, JK, will join Shane and me there. Lacy and I will come back home exhausted from trying to keep up with the bundles of indefatigable energy that JK and Shane are. Boston was a very intriguing two full days of meetings. There is the potential to expand the services that my firms can offer readers and investors into areas that I never knew might be possible. It is truly exciting, and I hope we can pull it off. I am off to meet with a close friend from out of town and compare notes on the world, one of my favorite things to do. I know we all have times when we wish we were being more productive, when we wondering why are we here and not moving the ball forward. But when I get to spend time with good friends, old or new, I somehow never feel that way. And while our pension systems may be going to hell in a handbasket, friendships will remain forever. You have a great week. Sep. 16, 2017, 6:52 p.m. The irony is that public employees have retirement benefits that generally exceed private sector benefits available to taxpayers. Part of the solution is for all the states to pass laws that prohibit and severely restrict retirement benefits for future government employees.